The movie ticket binder project came to life in December 2012. 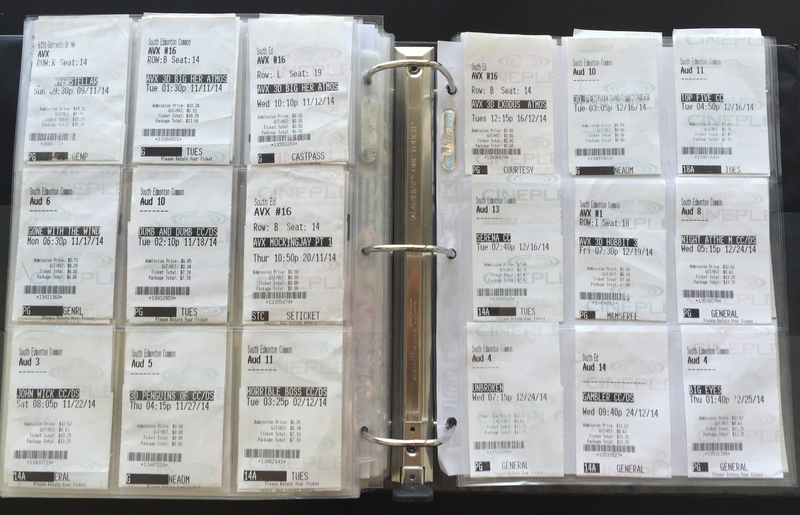 Many people were surprised to know that I have a movie ticket stub for every movie (minus four) I’ve seen at Cineplex since my move to Canada in June 2008. Some of my friends at the theatre told me they did various things with their ticket stubs and I had to come up with a way to display my enormous collection. For several years my tickets just sat in a shoe box and I didn’t have a way to showcase the 500+ movies I’ve seen. When I was a kid I collected hockey cards. The majority of movie tickets can be folded down to the size of a card so it made perfect sense to put them in the pages that once housed my hockey cards. As the idea started to come together for this project, it took me about two weeks to design and piece together my entire collection in one black three-ring binder. I keep a spreadsheet of how many movies I see in a year and this is the official list with the ticket numbers. If you are interested in what I’ve seen and how many tickets I have, check out the link below to see where I am at. Hey! This is pretty cool, that must take a lot of dedication! Im in AB too! Thanks. It hasn’t been easy thats for sure! Wow that’s A LOT of theatrical viewings. I try to average about 500 movies a year (sometimes more, or less) but most of mine are watched at home due the hassle of having to drive over an hour to a decent movie theatre. Very cool! I’ve always tried to keep mine, too! I started putting them in a similar style binder recently, but i have ticket stubs of all sizes, so they don’t always stay in place. Do you use anything like a notecard or anything to tape them to, to keep them in place? There are two tickets, back to back in the same slot, so they usually stay in place. Do you have any pictures of yours or keep a list that you could post? It is amazing to see what people do with their ticket stubs and always a great way to strike up a conversation. I may not fully appreciate poetry or the ballet, but I appreciate Organization, and this project has it in spades. Thanks! It took a little while to piece together in the beginning, but super easy to update now. In nine years I’ve only managed to lose four tickets. People always tell me they put their tickets in a box, I wanted to show them to anyone who didn’t believe I had so many tickets!